Aim: Create a DIY protocol for lycopene extraction that can use the Desktop spectrometer to identify and - hopefully - quantify the amount of lycopene extracted. Test 2: Extraction using diethyl ether. UV spectrum matched lycopene (see image). 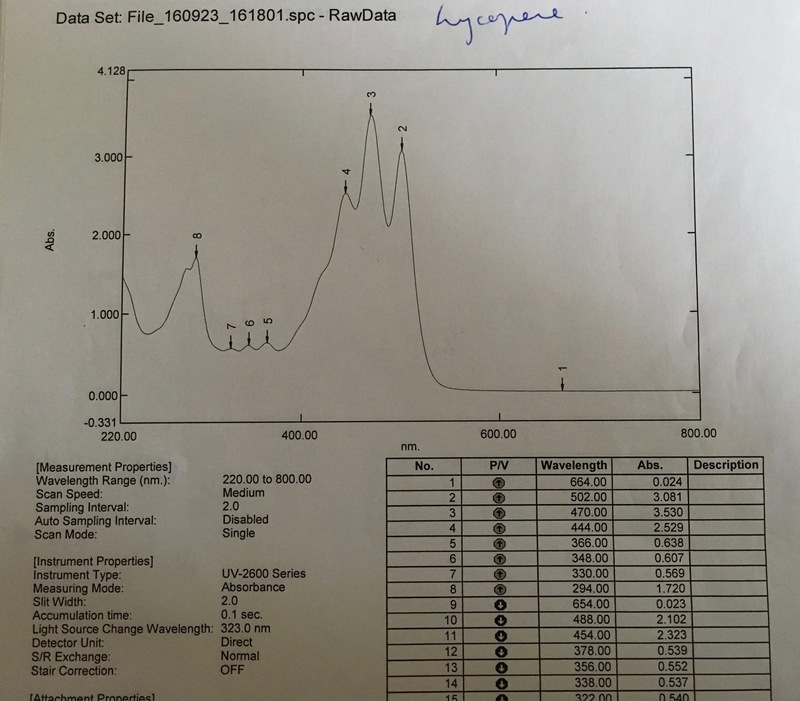 Desktop Spectrometer V3 spectrum matched lycopene, but with not so clear definition in peaks. Test 3: Extraction using engine starter fluid (mixture of hexane and ether) UV spectrum matched lycopene (see image). Desktop Spectrometer V3 spectrum matched lycopene, but with not so clear definition in peaks. It looks like the engine starter fluid is not as effective as the pure diethyl ether at extracting the lycopene from tomato paste. 1) Try to quantify amounts from the UV and Desktop Spectrometer spectra 2) What changes to the protocol would result in complete extraction? Is this achievable? 3) Try to purify the engine starter fluid to get pure ether - is this achievable and safe outside of a lab environment? To generate reliable protocols that can be used to answer questions about the lycopene content in food with valid results, outside of a lab. I'm developing these protocols as part of a much larger project looking at a multiple knowledges / subversive knowledge production approach to food, supported by the London Creative Network and UCL. The first output will be an undergraduate course in January 2017 that tests these approaches with a London community. Do you have a standard lycopene extraction? How do know what the spectrum of lycopene should look like? Are you using a fluorescent lamp to make your extraction spectra with the Public Lab spectrometer? The lycopene peaks between 440 and 500 nm will only show up clearly if you use a continuous spectrum light source like a halogen lamp. Have you compared these results to an extraction using just water or alcohol? These solvents will not extract all of the pigments, but might allow you to identify lycopene. Quantifying the amount of lycopene might require some other approach. Hi Chris, what do you mean by a standard lycopene extraction? 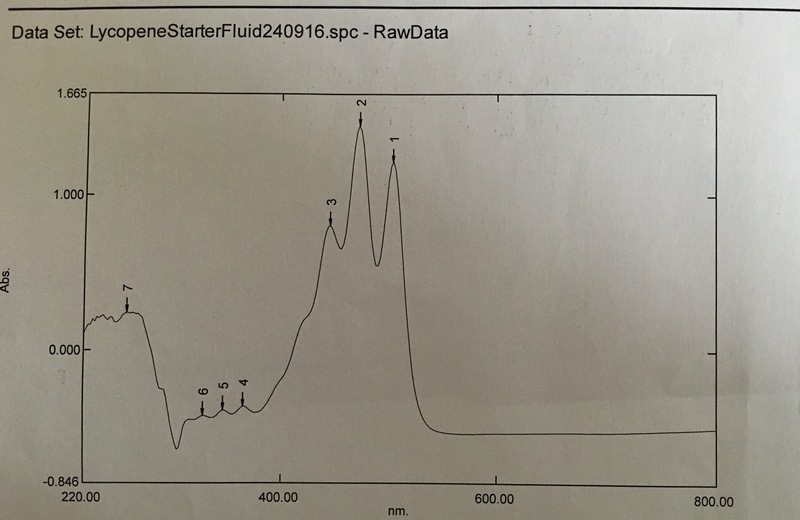 The UV spec of lycopene in ether can be found here http://link.springer.com/article/10.1007/s00217-006-0541-4 with three distinctive peaks at 503, 472, 445 and another at 363. My peaks are at 502, 470, 444 and 366. My sample seems to have something else in there too, perhaps another carotene. I'm using a CFL and have calibrated to it. I wanted to use a halogen lamp but couldn't work out how to then calibrate it wrt the CFL spectrum provided. Is it explained somewhere? After you use a CFL to calibrate the spectrometer, replace the CFL with another light source. If the spectrometer is not disturbed, you can apply the calibration to the images saved while using the other light source. I don't know whether that is explained anywhere, but I guess it should be. Ah that's really helpful to know, thank you! Ah, i see you've already approached this topic, sorry to repeat!